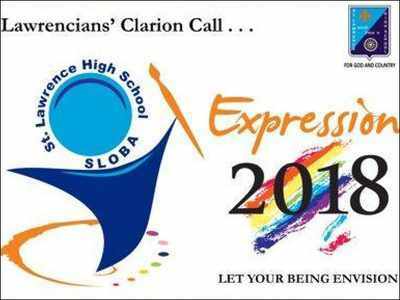 After a grand success of ‘Expression 2017′, St. Lawrence High School (SLHS), Kolkata, India, in association with their alumni St. Lawrence Old Boys’ Association (SLOBA) are organizing an international Drawing and Painting competition ‘Expression 2018’ tomorrow to celebrate Olympic Day and promote Olympic values and peace among school children. Theme this year is ‘Olympic Games and Youth’ as the world will be coming together for 3rd Youth Olympics in Buenos Aires, Argentina in October this year. Noomi Mehta, president of Indian Rugby Football Union will be the chief guest for the program. ‘Expression 2018’ will felicitate Gurbux Singh for the achievement in 1964 & 1968 Olympics and also teen shooting sensation Mehuli Ghosh will be felicitated for qualifying for the Youth Olympics to be held in Buenos Aires, Argentina in October this year during the inaugural ceremony at St. Lawrence High School. The drawing and painting competition is open to all schools in Kolkata. Schools from rest of India and abroad are participating in online category. We have already received entries from Australia, Afghanistan, Spain, Malawi, Zimbabwe and India. Last date of submission for online category is June 30, 2018. All participants in Kolkata to get free passes from Fanattic Sports Museum and winners will get passes for their parents too. Winners in all categories to receive certificates and goodies from IOC’s Olympic Museum. In continuation to ‘Expression 2018’ on Sunday, 24 June, 12:15 pm, there will be a small program conducted by sports expert Boria Mazumdar at Fanattic Sports Museum. Peace and Sport (Monaco), Educate Magis , Air India and Fanattic Sports Museum are partnering us for ‘Expression 2018, said Mukherjee. Olympian and artist Mr Roald Bradstock, who is better known as the “Olympic Picasso” is the ambassador for ‘Expression 2018’ and is in the city from Atlanta, GA,USA for the event. On April 25, 2017, International Olympic Committee (IOC) President, Thomas Bach, appointed Mr. Bradstock to IOC Culture and Heritage Commission. Bradstock was also part of Olympic Art Project during Winter Olympics 2018 in PyeongChang in South Korea.